This flyer just came into the office on WB20C – 20 oz. Bike Bottle from Garyline. 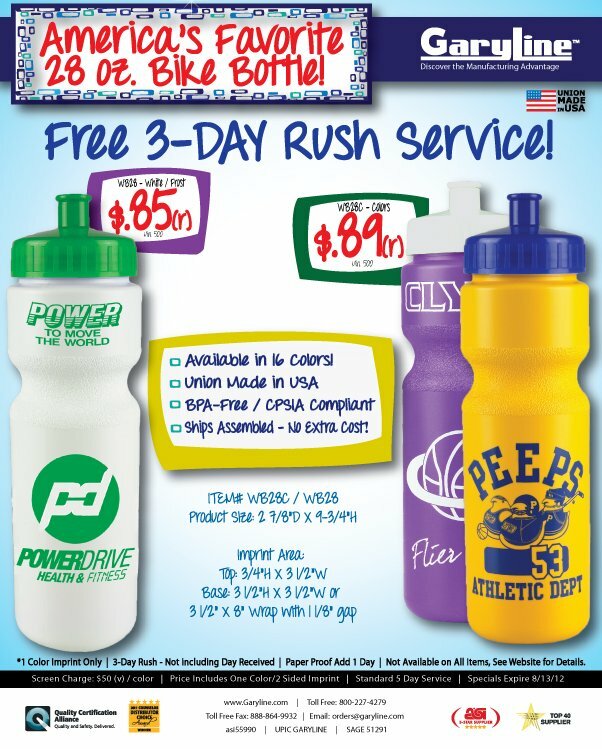 The WB20C is a Union Made in the USA sport bottle that comes in 16 colors. The bottles are molded from HDPE (high-density polyethylene) – Recycled Code 2 – and are BPA-Free. Additionally Garyline offers WB20C bottles made from recycled materials in black, green, and navy blue. If you are a promotional items distributor looking for more information on Garyline items Stu Schoenfeld is your contact at Garyline. If you are interested in these items for your own marketing contact your local promotional items vendor or email info@proformagreen.com for information and pricing.